It is a kind of sensory problem in which issue resides with the sensory system. Cortical sensory system is most commonly affected area associated with this disease. In graphesthesia the primary sensations are to intact and for the same reason there are passive touch issues with the patients. The parietal lobe injury or damage is actual cause of problem. There are tests that can make it clear that patient is suffering from the disease. The disease is curable in a sense that there are treatments available through which the somatosensory cortex in the left parietal lobe can be revived. However the recovery time can vary from patient to patient. There are number of conditions that are tested during the examination of the graphesthesia. It is kind of ability that can help human recognize the letters or the words written on to the skin. The disease name is derived from the Greek work; the graphe means writing and the aesthesis means perception. The letters are traced onto the skin. For that there are pointed objects are mostly used. In most of the patients there are lesions in brainstem, due to which the patient cannot have the stimulus properly and as a result the patient fails to recognize the exact word or the letter written. For the diagnosis of graphesthesia, there is a test that should be done. The neurological condition is to be tested by using various objects on the palm of the hand. The disease is actually hemispheric that can be related to the parietal lobe. The test can only be positive if there is an issue with the somatosensory association. If the words or the letters written by the examiner onto the palm of the patient is not identified properly then the test could be called positive. If the patient fails to interpret the sensation onto the palm then there will be clearly an issue. In order to ensure that the patient is suffering from the graphesthesia, there is a test that is to be conducted. The tests results can identify that weather the patient is suffering from the disease or not. There are letters and the numbers written directly on to the palm. 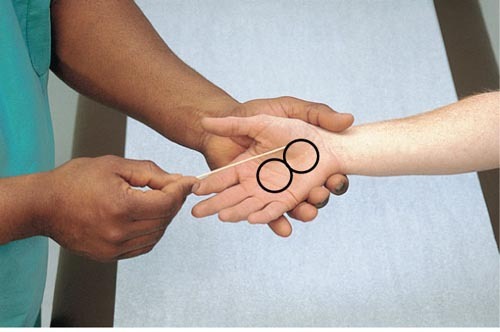 The ability of the patient to interpret the letters written on to the palm is the primary reason for the test. The test is actually a sensory exam that can actually identify the level of the problem that a patient is having. As a result of the test it is easier to find out the severity of the issue. In order to have the assessment, there are some standard procedures that are to be followed by the experts. During the assessment of graphesthesia, there is a typical method used. During the procedure of the assessment, the palm of the right and the left hand is used. There are letters that are to be written on the palms of the hand. If a patient is unable to identify the letter that is written than it can be said that the patient is suffering from the graphesthesia. The assessment of the problem is based upon the physical examination of the response given by the patient.